Hiring a Car Accident Lawyer in Vermont or New Hampshire? We Can Help. At Sabbeth Law, we represent people facing injuries from all sorts of car accidents and vehicle collisions in Vermont. In fact, we represent the injured in all types of vehicle accident cases, from passenger-car to dirt bike to motorcycle accidents to tractor-trailer collisions. We even represent people injured through the negligence of others in boating and snowmobile crashes. After a motor vehicle crash in Vermont or New Hampshire life can be difficult. Perhaps you cannot return to work or afford to pay your medical bills. This is why it is extremely important to learn more about filing a claim for compensation. You should know that you are not alone. The Insurance Institute for Highway Safety (IIHS) reports that more than 60 car crash fatalities occurred in Vermont in 2016, while the National Highway Traffic Safety Administration (NHTSA) indicates that thousands of people sustained injuries in crashes. Although Vermont is among the states with the lowest total of auto accident fatalities. Still, many preventable collisions happen in the state. If you’re facing injuries because of another driver’s negligence, you should speak with a Vermont car accident lawyer about your case. When you file a claim, you should know how to find an attorney who is the right advocate for you. An advocate at Sabbeth Law is ready to work on your case today. When facing injuries from a motor vehicle collision, we know that it can be difficult to even think about finding time to meet with an attorney. However, the sooner you start on your claim, the sooner you may be eligible for compensation. Meeting with car accident attorneys is the next step in recovering damages. Traffic crashes leave victims unable to work and thereby unable to earn an income. Sabbeth Law focuses on helping you obtain compensation for your losses and for holding the responsible driver accountable. From the outset of a car crash, the most important tip we can give you is to keep calm. Easier said than done, and maybe not particularly helpful if you’re reading this after an accident. However, on the chance this helps even one individual, we include it here as it is truly one of the most important tips and can affect many other aspects of the events that follow. If you can remain calm you will be much more effective. You can help yourself and assist those around you facing serious injuries from the crash. However, you should only do this if your injuries are not too severe. Of equal importance, make sure your injuries aren’t severe before assisting your passengers or anybody else involved the car accident. Despite our gut reactions and instincts, it truly is most important to make sure you’re okay before reacting and trying to help others. This can be tough to swallow, and we absolutely understand why. However, if you’re not okay, you almost certainly will not be able to help anyone else. In fact the situation could be made worse. If you or someone else is injured after a car accident, call for medical attention. Though, like many of us (myself included) you might hate the idea of calling for medical attention, even when you’re obviously injured, it is extremely important to do so. Read my “what to do when you’ve been injured” page for detailed information on why this is so much more important than we’re likely to realize. If you’re involved in a car crash in Vermont, get a police report — especially if someone has been injured as a result of the car crash. While most of us know to exchange insurance and contact information with people we’ve been involved in a car collision with, we don’t always get all the information we need. Not because people don’t care; but because, hopefully, being in a car accident — resulting in an injury or not — is a very rare situation for most people. A police report also protects you from when another party all of a sudden says the car accident didn’t happen the way we know it did (which our firm has witnessed on several occasions). When there’s no police report to document what actually did happen in the car crash, it is often the injured victim that pays the price. It takes minimal time to get a police report and it truly safeguards all parties. Let the pros do their job. Get a police report to make sure all necessary info is exchanged and all evidence as to how the collision happened is preserved. Your own insurance information and records of your contact with the insurance company. 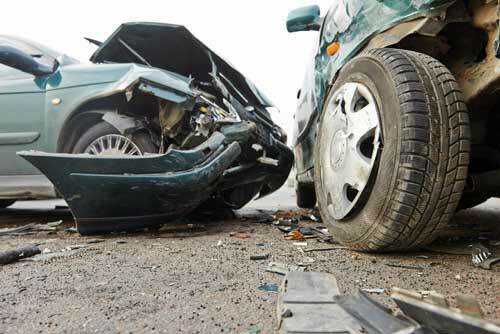 Your car accident lawyer will emphasize that your insurance company is not on your side. Even if you have been a loyal customer of Allstate, State Farm, or another insurer for years, that insurance company focuses on its own bottom line. Your Vermont car accident lawyer will advocate for your right to compensation and can deal with the insurance company for you. The best car accident attorney will make clear to you that, even if the defendant argues that you bear some responsibility for the accident, you can still recover damages. In Vermont, we call this comparative negligence (12 V.S.A. Section 1036). Your attorney can help you to understand how this works, as well as to emphasize that comparative negligence will not necessarily prevent you from obtaining compensation. What is comparative negligence? Under Vermont law, it is a defense that the other party can raise, arguing that the plaintiff is also responsible in some capacity for the crash. The law says that, as long as the plaintiff is not 51 percent or more responsible, she can still recover damages. For example, if your car accident claim goes to court and a jury determines that you are 20 percent to blame for the crash, you will still recover 80 percent of the damages award. In other words, the State reduces your recovery by the percentage which you are negligent. Accident reconstruction reports from an accident reconstruction expert. Hiring an experienced car accident lawyer in Vermont means finding an advocate who will handle your case in a timely manner. As we mentioned, the sooner you file a claim, the sooner you can be eligible to receive compensation. More important, however, is recognizing the statute of limitations for car accident claims. If you need to file a lawsuit, the Vermont statute of limitations for personal injury claims (12 V.S.A. Section 512) is three years. This means that you need to file your lawsuit within three years from the date of your injuries or else you lose your right to seek compensation by suing the negligent driver. It is normal, “will the responsible party pay my medical bills?” after somebody injures you in an accident. If you have retained a Vermont personal injury lawyer, you will have already learned that most cases should not be settled until most, if not all, of the medical treatment has been finished, or until future medical expenses can be formulated. Most people nowadays have large deductibles on their personal health insurance, if they have personal health insurance at all. So how do you pay your bills in the meantime? Most automobile insurance policies in Vermont have provisions for what is called “medical payments coverage.” If injuries occured in your vehicle — no matter who is at fault — and you have medical payments coverage, it will pay for all related medical treatment up to the amount allowed by your policy. That includes copays, prescriptions, and all types of medical treatment. And that also applies to anyone else injured in the vehicle with the medical payments coverage. One of the first things we do at Sabbeth Law is check if our clients have medical payments coverage. If so, we use it to satisfy our clients’ medical bills. You might quite correctly wonder, why should my insurance pay for medical treatment caused by the negligence of another? The first and easiest answer is that you have paid for that protection when you pay your premiums every month or year. The second is, in states like Vermont, they will be reimbursed by the negligent party’s insurance company when the case settles or if a jury issues a verdict. Medical payments coverage’s most important function is that it allows you to be able to pay for your medical treatment resulting from a car accident in Vermont as you get the treatment. You don’t have to wait for your case to settle or a jury verdict, and you don’t have to use your personal insurance and get slammed by the large deductibles that often accompany those policies. What If The Person Who Injured Me Doesn’t Have Any (or Enough) Insurance? This is a very common and worrisome issue that Sabbeth Law regularly confronts in Vermont car accident cases. In these cases, we look to “underinsured” (UIM) and “uninsured” (UM) bodily injury motorist coverage. If you or a family member that you live with have an insured vehicle, UM/UIM coverage is likely on the plan. This coverage provides invaluable protection that allows you to maintain a Vermont personal injury cases against someone who negligently injured you, even if the person who caused your injury doesn’t have insurance. How? It will pay for the damage that the uninsured driver caused in the car crash, including your medical bills, pain and suffering, and lost wages. Of course, you have to prove damages just the same as you would if the case was being brought against the person who injured you through their insurance company. For example, what if a driver who has no insurance causes a car accident resulting in injuries, and we prove you sustained losses valued at $100,000.00? Your insurance will pay that amount of money to you through your uninsured motorist coverage, if your limits are $100,000.00 or higher. If you have less uninsured motorist coverage (for example, your limits are $50,000), it will pay out up to the amount of your limits. What an “underinsured” driver hit you and cause injuries? An underinsured driver is someone who causes a car accident and injury with losses greater than their insurance covers. Like in the above example, let’s say your damages are determined to be $100,000.00, but the person who caused the car crash only had $50,000.00 in insurance. If you have $100,000.00 or more in underinsured motorist coverage, your insurance would pay the extra $50,000.00 you are rightfully due. There are many other issues in underinsured/uninsured motorist liability law, such as: Who does the policy cover? What types of Vermont car or offroad accidents does the policy cover? Will your insurance company fight you? If you have questions about the complexities of underinsured or uninsured motorist bodily injury coverage, call us. There are many, many other elements to car accident cases in Vermont. If you’ve been injured in an automobile accident in Vermont, call me at 802-457-1112 or get a free evaluation by clicking here. Our promise to you is that we will always give you my best legal analysis free of charge. Whether or not we agree to take your case, we will at least be sure to set you on the right path to help to make sure nobody takes advantage of you. Michael was incredibly helpful and was always willing to reach out if I needed it. It's hard to find lawyers that are just as genuine as they are dedicated to providing you with the highest standard of excellence. I'm so happy I had Michael on my side ... If you have high standards, he's your guy because I assure you, he'll exceed them.